The moment of one of the worst domestic terrorist attacks in the US. The moment that changed Oklahoma City and a nation forever. The moment when a fertilizer bomb went off at the Alfred P. Murrah Federal Building in Oklahoma City. Hundreds of people were injured, and 168 were killed, 19 of which were children who were playing in the daycare at the time of the bombing. 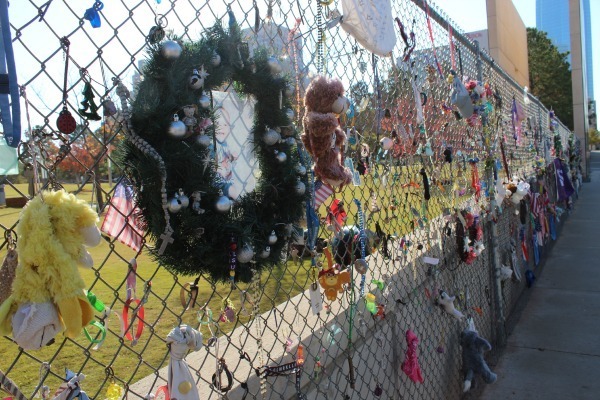 The days following the bombing, visitors began to leave mementos along the fence that was erected to protect the site of the Murrah Building. Over 60,000 items have been collected. 200 feet of the original fence allows people to continue to add personal tokens of remembrance and hope. Two twin gates provide passage into the Memorial. 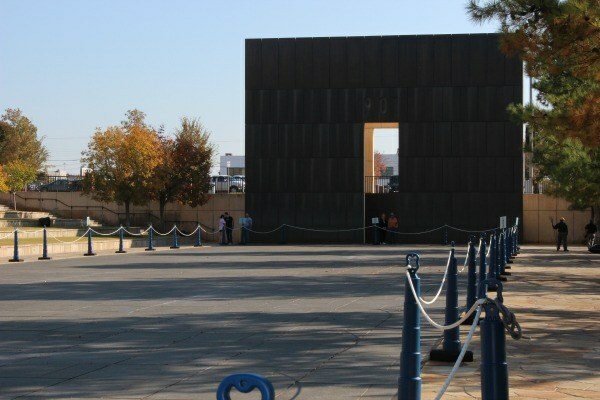 The East Gate represents 9:01 a.m. on April 19th and symbolizes the innocence of the city prior the to attack. The West Gate represents 9:03 a.m., the moment after the attack, when the city and nation was changed forever. The Field of Empty Chairs represent 168 lives lost, 19 of the chairs are child-size. The glass bases are etched with the names of the victims. 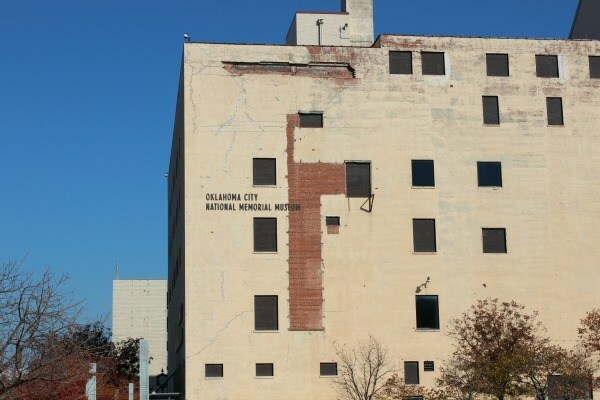 Two remaining walls of the Murrah Building highlight the names of those that survived the attack. 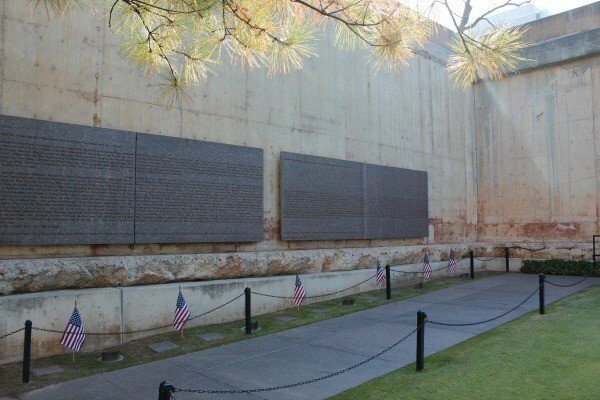 Over 600 names are inscribed in pieces of granite that were salvaged from the lobby of the Murrah Building. Normally a shallow Reflecting Pool flows between the Gates of Time but improvements were being made during our visit. 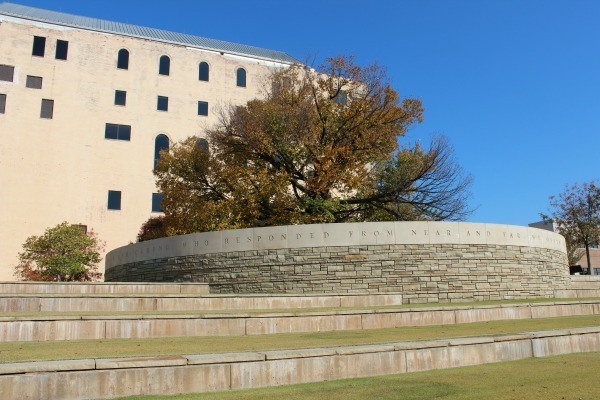 The Survivor Tree has stood on the property for 90 years and though damaged by the blast, has continued to stand as a symbol of human resilience. 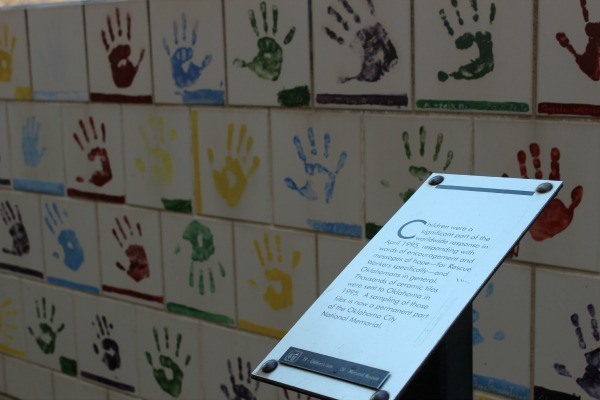 Near the Survivor Tree is the Rescuers’ Orchard, a tribute to those that rushed to help after the horrific attack. Before entering the Memorial Museum, still missing some of the bricks that were blown off during the attack, you’ll find the Children’s Area. A wall erected with hand- painted tiles featuring the artwork of children. 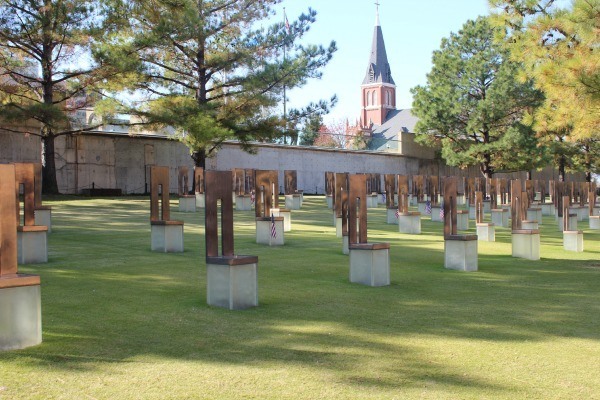 The Oklahoma City National Memorial is beautiful and touching but the symbol that had the biggest impact on me wasn’t found at the Memorial site, but just outside the gates at St. Joseph Catholic Church across the street. 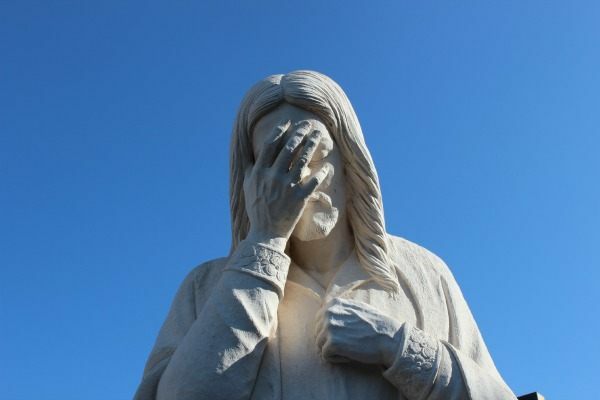 A statue of Jesus stands with His back to the gates, head bowed, hand across His face with the words “And Jesus wept” inscribed at His feet. 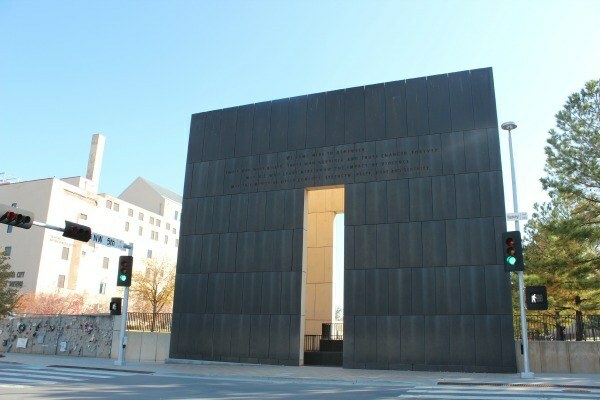 Planning to visit the Oklahoma City National Memorial? Cost: There is no charge to tour the grounds. You’ll find restrooms open outside the museum during museum business hours. There is limited free on street parking. Paid parking is available on Northwest 6th Street and to the East on Robinson. Street parking is available on Northwest 5th Street to the east and the west of the Memorial. Handicapped parking is available on Northwest 6th Street near the entrance of the museum. © 2013 – 2015, Tonya Prater. All rights reserved. What a touching memorial – I had no idea it was so big. Beautiful. I bet seeing all those chairs, and the child sized ones would really make you cry. Nice post. My husband got to visit the memorial several years ago and told me about how moving it was. 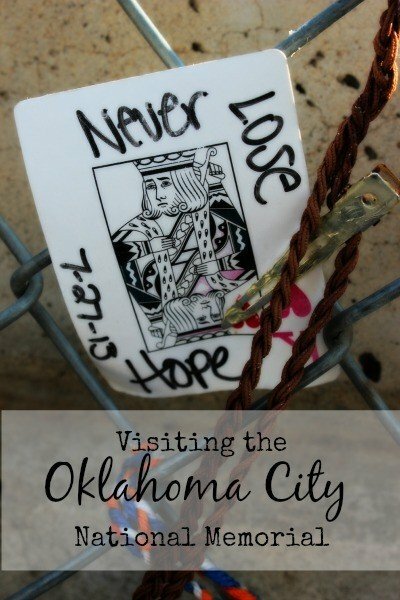 About a year ago we both were able to go on a trip to Oklahoma City. We were able to visit during the day and the evening. Definitely was a moving experience. I can’t even begin to imagine the emotions I would feel if I were there. So moving and powerful…and sad. What a lovely memorial. I didn’t realize they had something this nice. Great memorial and excellent write up. I can only imagine how touching and powerful that memorial is. How moving! My husband was able to visit this on a business trip a few years ago, but I have never seen it. this looks like an awesome memorial. Much thought was put into putting everything together! It is still so very hard for me to process how such attacks happen. This memorial is beautiful and heartbreaking at the same time. I just watched a special on the Oklahoma bombing recently and all those memories came flooding back. I didn’t know too much about the memorial but what a wonderful place to visit. The chairs and the Jesus statue are especially moving. I’m glad they still add personal tokens here. That survivor tree is amazing. I still remember newspaper photos from that awful day of firefighters carrying bloodied children out of the building. So very sad. This must have been a very moving visit. It’s been an week of preparedness for my kids. They did a lockdown drill and firedrill at school. Today, the Boy Scouts practiced emergency response and rescue. I hope that they’ll never need to actually put any of it to use. 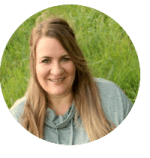 Hi Sonya, Sucht a very moving post. I’ve read a lot about this memorial site but not with this much detail. I’m so touched by the Field of Empty Chair with 19 child-size chair. 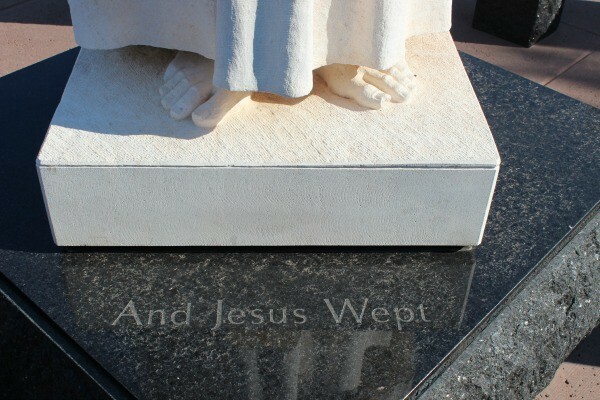 Most of all, I’m deeply touched by the sculpture of Jesus weeping. It’s so powerful. Fantastic memorial. 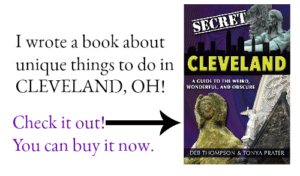 Jesus weeping, the empty chairs, survival tree and children’s artwork – sentimental photos. So absolutely incomprehensible. . .and what a beautiful tribute you paid the incident and the site in this post. The last two photos gave me chills. I am reading this on Nov. 22 – the 50th Anniversary of the death of John Kennedy. . .another incomprehensible moment in our country’s history. I agree, Jackie. Both acts are incomprehensible. My son and I visited the Sixth Floor Museum last year in Dallas- focused on JFK and his assassination. The museum was very sobering. Ohhh, what a fantastic memorial but what a terrible memory. The statue of Jesus is particularly moving in the pose the sculptor has put him in. Thank you so much for popping over to my travel blog ZigaZag earlier to comment. I think we hooked up via Travel Photo Thursday. Nice to meet you. Have a wonderful weekend! Such a moving tribute. I like the idea of the empty chairs and all those empty chairs together. And the statue of Jesus. Very moving tribute. Still so incomprehensible after all these years. The site is open 24 hours a day. I almost wish we’d visited at night because the chairs are lit at night. I imagine the view at that time to be even more powerful. What a beautiful site that has emerged from this devastation…it must be very hard to visit something like this but also inspiring to see.